A Missouri legislative task force to help students struggling with dyslexia will hold its first meeting Tuesday morning in Jefferson City. A legislative task force will meet Tuesday morning at 11 at the Missouri Statehouse to discuss ways to screen dyslexic students, and provide classroom support for them. Legislation adopted this year by the Missouri General Assembly requires the creation of such a program by 2018 and implementation of the program by the 2018-2019 school year. Dyslexia is a learning disability characterized by difficulty reading. The law also requires that teachers take two hours of training about dyslexia. 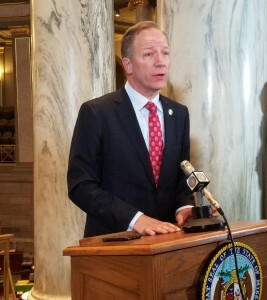 Task Force members include State Sen. Bob Onder (R-Lake St. Louis), State Sen. Scott Sifton (D-Affton), Lorrie Wolf of the Missouri International Dyslexia Association and Terry Osborne, a citizen with four family members diagnosed with dyslexia.